Andrew Colas may be young in years but he's been learning about the construction industry since he was old enough to tag along behind his father. 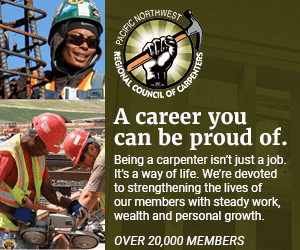 Now Colas is seizing the opportunity to put his knowledge to work for communities of color, as the new president of the Oregon branch of the National Association of Minority Contractors. The University of Oregon graduate says he has two main goals as NAMC Oregon president. First off, he wants to continue the advocacy work that has helped minority contractors win a fairer share of the work in large construction projects, such as the $39 million Portland Community College Southeast campus expansion. "I'm really hoping that Portland Public Schools will look to PCC as they begin work on their $450 million bond projects," Colas said. "There is no reason that they can't create real opportunities for minority-owned businesses. It's good for the whole community when all members of our community benefit equally from taxpayer funded projects." Colas second priority is bringing more minority youth into well paid construction jobs, and making sure the pathway to management positions is sustainable. "A lot of kids don't realize the types of salaries you can earn in this industry," he says. "As a project manager you can make $80,000 to $150,000. So one of the things I want to focus on is showing elementary, middle school and high school students the great opportunities that exist. "Oregon State University has one of the top construction management and engineering programs in the country and actually Portland Community College has developed a construction management program. All the big general contractors in Portland provide internships and they go to those programs for interns, so the opportunities are there." Colas believes some form of new bridge will be built across the Columbia River within the next five years. But opportunities in construction are set to grow whether or not the project goes forward. He says NAMCO is working with the Oregon Department of Transportation to strengthen that relationship. "We can help them in areas where they have failed in the past," he says. "NAMCO has to argue that minority businesses in general have more capacity than ever before and an excellent track record." Ambitious young people can enter construction either by apprenticing in a trade or by going directly into construction management, Colas says. "We need to find ways to see more people of color at mid-level positions in all the companies in this town," he says. "Once kids from disadvantaged communities see people of color in management positions they will start to realize, 'I have a real opportunity here.' Then we will really start to see sustainable change in our industry." Colas himself might be the perfect ad for the construction industry. A sharp dresser who drives a shiny Acura TL, he's married to a sports agent who splits her time between Portland and Los Angeles. "There's a sense of pride in the construction industry that's unique," he says. "The projects you are involved in can be there for your lifetime. You can point to them and say, I did that." Colas says he was lucky to have two nurturing parents and a comfortable Portland childhood. He attended Whitaker middle school in Northeast Portland, and went to Benson High School, before moving to Lincoln High School in his junior year. With friends from both wealthy and struggling families, Colas learned that success or failure is not always down to personal character: it hinges on the environment you inhabit and the opportunities you are offered – or denied. Colas also knows what it means to be racially profiled. "I was stopped 26 times before I was 21, without cause and without getting a ticket," he says. And while he is president of the family business, Colas Construction, he's also modest about it. "My sister was my father's first choice for president, but she elected me," he says. "She likes to focus on the office side, so she's vice-president and I'm president. She's the real boss." Colas' older sister is Aneshka Colas-Dickson, one of the commissioners on the Portland Development Commission. Their father, Hermann Colas Jr., a Haitian immigrant, built the business after a 20-year career with telecommunications company U.S. West. Until recently most of the company's business was in the private sector. "My father instilled in us a very strong work ethic," Colas said. "He made sure everything he did was quality. We have a great reputation because my father left it that way. And it's critical. Integrity is critical in this business."